Bladen: Three piece linen suits in cream colour and two piece suits in navy arrive in end of March. Blazers in wool and linen and in mixes are in. 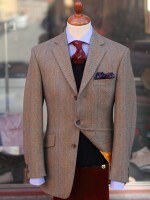 We stock lighter tweed jackets in spring colours. Trousers in needlecord and cotton twillA fabric woven in parallel diagonal ribs, by passing the weft thread alternatively over and under one or more warp threads. Tweed, gabardine, cheviot and denim, for example, are all twills. and business suits in lighter wool will arrive mid March. A ladies tweed jacket with matching skirt arrives early April. Magee: We have a nice new moleskin coat in taupe colour in store. William Lockie: New colours of geelong 1-ply jumpers and slip-overs are soon to arrive. Peregrine: We are fully stocked in wax cotton and cotton laminate jackets perfect for rainy days. Tricker's: We have just received our first MTO Tricker's shoes. Two-tone Bourton brogues in leather/canvas and grain leather derby brogues all on Dainite soles. Rayner & Sturges: We have nice poplin shirts in stock in pink, blue and white to match any summer outfit. Olney headwear: Panama hats, straw boaters and casual linen hats and caps are arriving end of March. Corgi hosiery: Spring colour socks will arrive in May.